The Quaker Settlement – Solar Array – sustainable energy project. 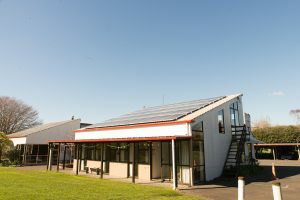 At the Quaker Yearly Meeting in April 2011 it was agreed that installing a Photo-voltaic Solar Array at the Settlement would serve as a testimony to our care for the earth and could be seen as offsetting the Society’s carbon footprint incurred by Friends travelling on our collective business. Our goals would be educational, economic and environmental. The total cost was estimated at $55,000 excl GST which was raised by gifts from individual Friends and from the Society’s funds with a contribution from Settlement funds. 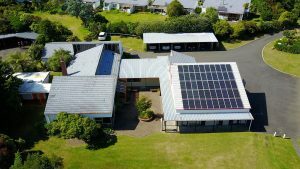 We opted for PV Solar systems and selected powercrisis of Ramarama, South Auckland as our supplier. 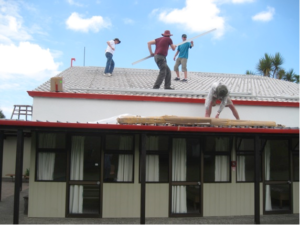 The site chosen to implement the solar array was the roof of the Sleeping House built in about 1980 with a concrete tile roof. It faced almost due North (almost ideal) with a pitch of 19 degrees (flatter than ideal but favouring summer energy collection). An ideal location for an inverter and connection to the building’s main electrical supply were nearby. 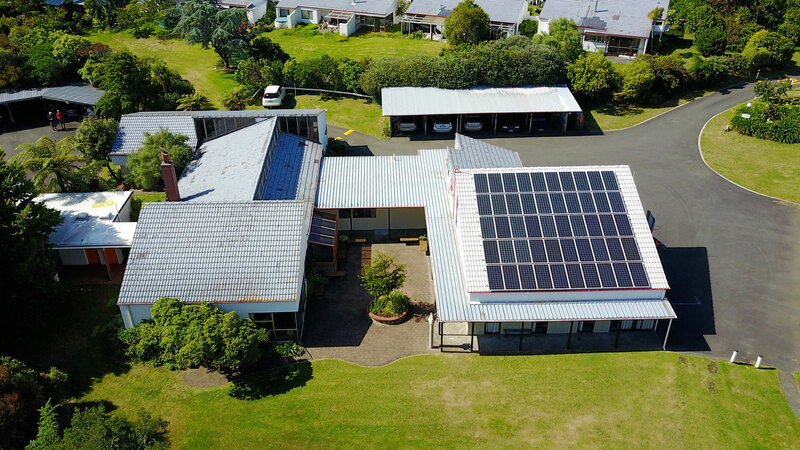 We calculated the roof was a size that would carry 50 standard panels @193watts each which would give us a total of 9.650 kilowatts (just under the 10Kw transition limit). A challenge was the roof itself. It was 30 years old and needed to be brought to a condition where we could expect it to remain waterproof for another 25-30 years without attention since it would be covered by the array. The existing structure was ideal being 200×100 Douglas Fir rafters at 1.300crs. 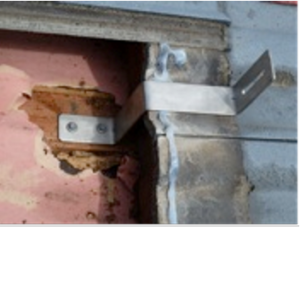 No suitable proprietary fixing brackets could be found so 70 purpose-made brackets were made from stainless steel. 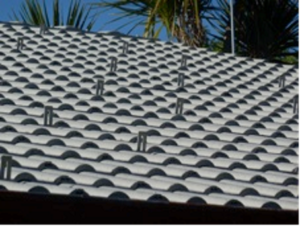 The roof had to be opened up in 70 locations to allow the bolting of each bracket to a rafter. This allowed a detailed inspection of the roof itself so that any cracked or chipped tiles could be replaced before the tiles were sealed and painted. The electricity supplied from the array is at 400volts and is DC. The panels are arranged in 5 “strings” of ten panels. Each string is wired via a cut-out switch board, to the Inverter which converts the DC current to AC which is compatible with that supplied from the grid. The wiring is carried in trunking and concealed where possible. The panels we used are Chinese-made ZG mono-chrystaline 193 watt modules and are guaranteed to produce 80% of their rated capacity at 25 years from installation. The 10Kw German STECA inverter is a major component in the system. It is heavy, needs protection from interference and must be well ventilated. Variable speed fans keep it cool and make some noise when the system is at work. 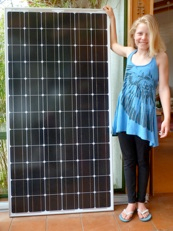 The whole system: panels and inverter, operate best when they are cool. The panels are gathering light of a certain wavelength (not heat as some people assume) and converting this to electrical energy. They need to be cleaned down periodically to prevent dust and dirt accumulating on their glass fronts and reducing their efficiency. A public open day was held on January 24 2012. In the first year of operation the array was scrubbed down once in midwinter. There were some problems with meter-reading (followed by debit bills when were actually in credit) but this has been tracked to faulty meter reading resulting from a problematic meter design for this location. Meridian, to their credit, have been prompt in their responses to our problems. Over the first year the total production was 13.12 MEGAwatt hours (i.e.13,000 units). Some of that was used on site and the balance was sent to the grid. Our input to the grid has been credited at 25c/unit. In money terms that amounts to about $3,250 for the year which is a little better than anticipated. The best day’s production observed was 67.55 kilowatt/hours. This was on a bright, cooler day and interestingly with high cloud; reminding us that we are harvesting light of a particular wavelength. It was also reassuring that the highest observed momentary output was 9.84 kilowatts (higher than the rated output for the array – 50 panels x 193 watts= 9.6 kilowatts). A check made over the month 25 Jan to 25 Feb 2013 shows an average production of 61.42 kilowatt hours per day, a textbook summer, day after day of clear skies, very little cloud and hot. 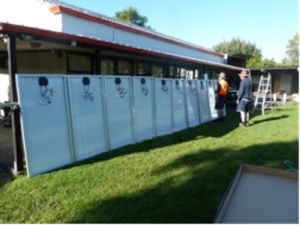 Since installing the grid we have now routed the power to service our common buildings, our guest accommodation and the swimming pool. In 2018 it is still functioning well during daylight hours. In 2017 we installed 5 electric vehicle charging stations for the use of guests and our residents. 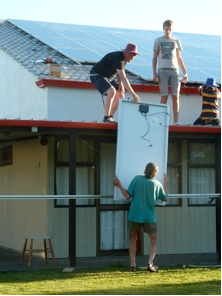 Wonderful to read about your project harvesting sunlight.